The second day of Christmas: What do you collect? Every year I think I’m going to have a smaller, simpler tree. Or a themed tree; do you ever do that? Restrict the tree to ornaments that are white, or hand-made or given to us as gifts, or angels, or birds? Each year, no matter what, my handful of Margaret Furlong ornaments, which I miraculously store in their original boxes year after year, are always the first ornaments on the tree. Each year when I re-encounter these white porcelain ornaments with their satisfying weight my mind goes to phenomenon of collecting things. Some people do, and some don’t. I’m in the “some don’t” category, but I always want to jump ship into the sea of collectors. I get oddly envious when I encounter others’ collections: pie birds, vintage bottles, conch shells, antique tape measures, or anything else that it would never occur to me to collect until I see it on someone else’s shelves. Years ago I worked with someone who had a snow-globe collection. She was being interviewed by someone from the New York Times and she didn’t want to have the person come to her apartment, so she brought all her snow-globes into the office. They lined all the shelves on three walls; probably about 300 snow-globes (she really didn’t want that photographer in her apartment!). They chronicled every trip she’d ever taken, as well as every friendship with anyone who cared enough about her or her collection to contribute. What make some people collectors? To a non-collector, it looks like it’s about loyalty and discipline. These are not qualities I lack, so there must be something else. It’s not like I have trouble holding onto things. But my things are more accumulations than collections. Yarn. Greeting cards. Knick-knacks. Perhaps the loyalty and discipline that sets collecting apart from accumulating is wed to particularity, a singularity of focus that sets collections apart from accumulation. I’m left with more questions than answers. If I’m lucky, you who are collectors will comment: what do you collect? Why? What does it mean to you? What are your plans? Behold, a train. One of far too many Christmas ornaments in our family’s collection. Every year I try to cull through them; the past few years I’ve been somewhat successful. One of these years I will remember to get the box of cast-offs to someone who will appreciate them at just the right time of year. December, not February. We got several train ornaments when my son was of the age when trains provided infinite excitement and collectibility. I realize that some for some people, this could be any age. For our boy, it was about three to six. 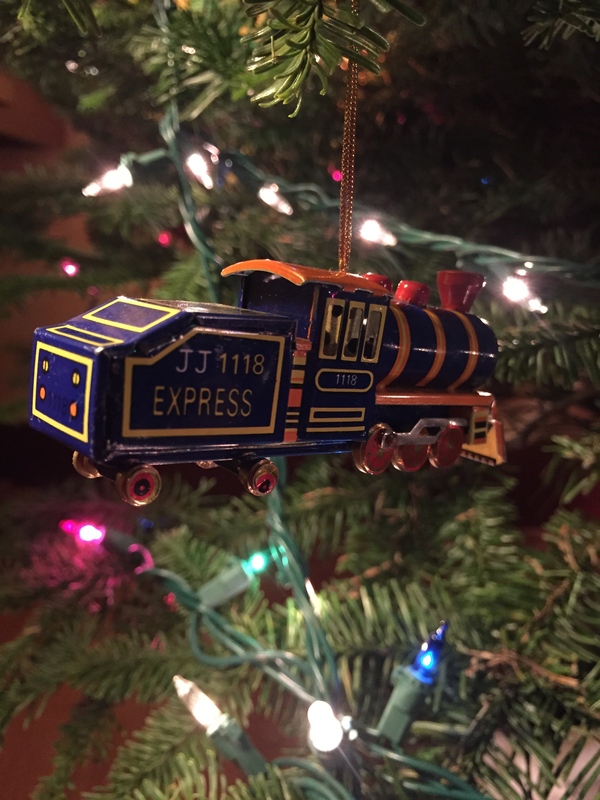 But this train ornament, today, is symbolic not of our family’s train era so much as of that train that we all have running through our heads, that train that is at times fascinating, at times tedious. My husband and I are particularly fond of writer Nicholson Baker, who manages to make great writing out of even the most tedious train of thought. Long ago we incorporated the phrase “Nicholson Bakerian” into our domestic lexicon as a way of introducing a meandering yet—one hopes—followable explanation of the mental journey one took to arrive at what one is about to say. With the right level of consciousness and detail, there are no non sequiturs, ever. What strikes me every Christmas when I put the ornaments on the tree are the associations I have with each ornament. Because I obviously have a little more time on my hands these days than I am used to (and you can read all about it here), my offering, for these twelve days of Christmas—in addition to the reminder to myself and my secular friends that there are, in fact, twelve days of Christmas—are brief meditations, meanderings, on these associations.